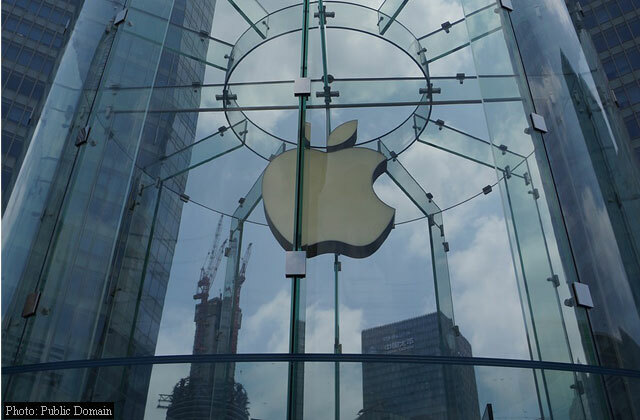 Apple Inc. (AAPL) shares are trading modestly higher this morning after the name was initiated with a ‘Strong Buy’ at Needham, which set a $150 per share price target. The firm recommends investors to focus on the company’s mobile device trends. Needham also said Cupertino dominates the wealthiest segment of a rapidly growing consumer market, and that the iOS platform churn is only about 12% annually, suggesting fewer competitive pressures, higher pricing power and more predictable revenue streams. On valuation metrics, Apple Inc. shares have a T-12 price/sales ratio of 2.62 and a price/book for the same period of 4.80. EPS is $9.41. The name has a median analyst price target of $130.00 with a high target of $200.00. Currently there are 38 analysts that rate AAPL a ‘Buy’, 6 rate it a ‘Hold’. One analyst rates it a ‘Sell’. In terms of share statistics, Apple has a total of 5.54 billion shares outstanding with 0.03% held by insiders and 60.20% held by institutions. The stock’s short interest currently stands at 0.95%, bringing the total number of shares sold short to 52.66 million. Offering a dividend yield of 1.89%, shares of Cupertino, California-based tech giant are down 12.17% year-over-year ; up 4.89% year-to-date. With its stock at $110.50, Apple’s market cap currently stands at just under $609 billion.